We are fortunate to have many of the residents of the Akron Area, who make the short trip to Tallmadge to allow us to care for their dental needs in our new state of art dental facility. Entrusting us with your family is very important to our caring staff here at Sisko Dentistry. With Akron being only minutes away, it’s worth it to know you will receive the best dental care from Dr. Gerald Sisko and a highly trained staff who are dedicated to providing General Family Dentistry, Cosmetic and Implant Restorative Dental Services, crowns, bridges, veneers, whitening programs, snore guards; as well as preventative care. 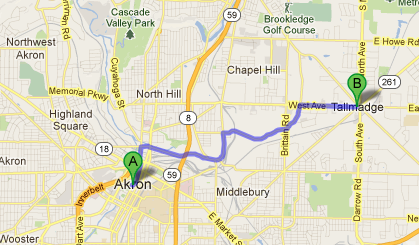 Take a look at the map above to see how easy it is to get to our practice.